This is the first event at the lovely Wembley Hilton Hotel. As guests entered the drinks reception they glanced through the large windows to see the glow from the lit-up arch of Wembley Stadium, which looked amazing. Guests enjoyed canapé’s and drinks while a live band played classic hindi numbers in the background. The doors were opened into the beautifully laid out reception, which had a lilac and gold theme to it. We brought in Krishan and Neena in our ‘Grand Entrance’ performance which was thoroughly enjoyed by all the family and friends present. 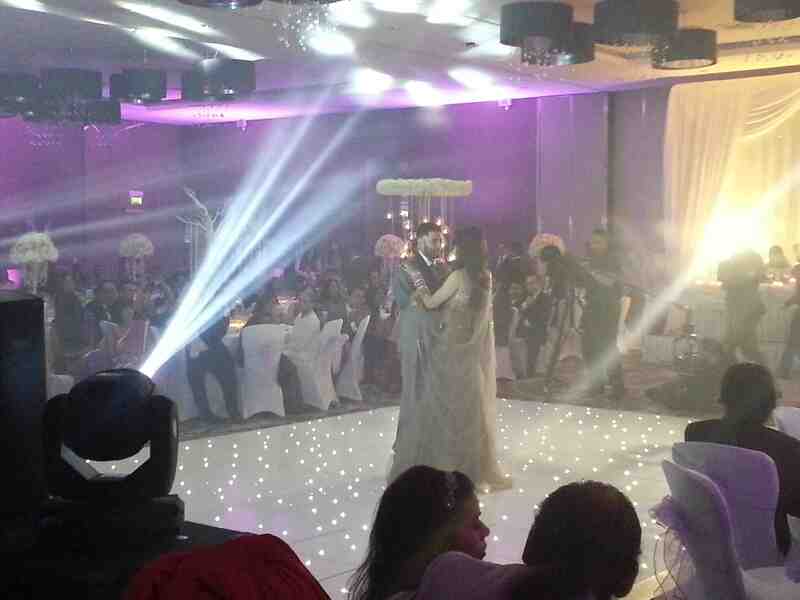 We escorted the couple all the way upto the sparkling white LED dancefloor. The happy couple looked great as they took to the spotlight for their ‘first dance’. We later got all the guests off their seats onto the dancefloor during our ‘Start The Night’ performance, which we did alongside the ‘Hitmaker Music’ DJ’s. A fantastic first event at Hilton Wembley! Congratulations Krishan and Neena.